“Trick Art” is the hands-on art produced by SD Corporation based on the long-term development of the creative activities, and “Trick Art” is a registered trademark of SD Corporation. It is created by Kazumune Kenjyu, the founder of SD corporation who established the company in 1984, and introduced origin of the Trompe-l’œil of the Ancient Europe; technology for perspective, shadow method, combination of receding color. 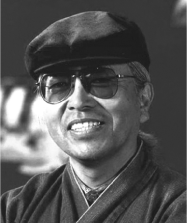 Kazumune first started his activity on the creation of the wall painting. Since then, many of the artworks have been aggressively produced at the Trick Art Studio “Atelier” and such original artworks with full of Trick elements have been recognized as the integration art of visual illusion, and three dimensional trick technology. Trick Art is also recognized as the products of harmonization of art; combination of perspective, design, geometry, and psychology elements. 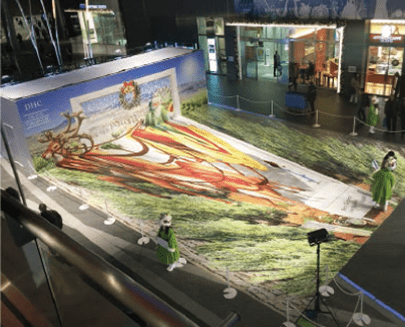 Currently, there are 17 Trick Art Museum in the whole country of Japan and enjoying the record of more than 2 million visitors each year including the visitors for exhibition and event held at around 20 places. Trick Art Exhibition has been highly evaluated in oversea and it is recognized as the newly superb art originated in Japan. *”Trick Art” is the registered trademark of SD Corporation. Museum is not for someone particular. It should be appreciated by everyone whoever has the artistic taste or not and can be enjoyable for people from small children to adult. 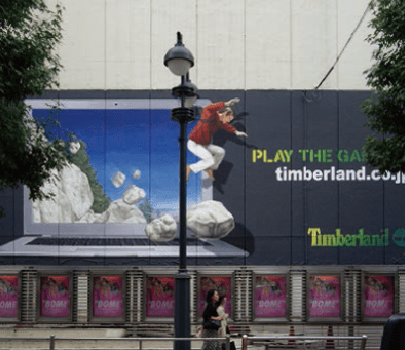 Kazumune Kenjyu evolved the art by creating “Trick Art” introducing it as interactive amusement media. He resigned the bank at 40 years old, since then devoted himself into the artistic world and continued his work with his philosophy that everyone should feel close to the art and enjoy them. Although he has past away at his age of 57 by the sudden accident, his never-ending wishes and techniques are continued to live within SD corporation. It is specializing the hand painted work as art. In order to realize the Kazumune’s desire for developing artwork as more friendly and familiar to everyone, we seriously maintained the hand painted artwork. Trick Art is introduced as the public art these days. 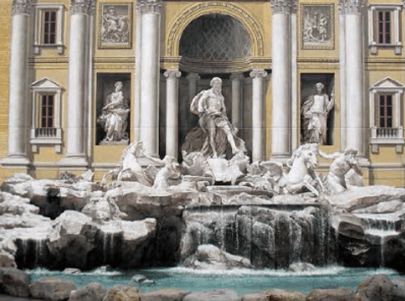 The artwork which many people can enjoy at the public place is created by one’s hand. It is our policy to challenge developing the artwork continuously under difficult conditions even it is on the large and complicated wall or the asphalt. The museum we established in order to realize the free art appreciation, where you can see, touch and take photos, is expanding to 17 places in Japan. 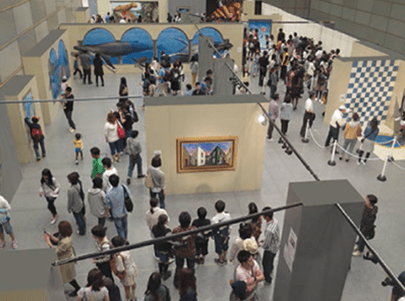 Trick Art exhibitions are highly evaluated not only in Japan, but oversea as the events with the records of 2 million visitors per year. We deliver the new discovery to many people. We create the surprising artwork by working together with the client! Our wishes and aims are to make people feel comfortable, surprise and enjoy the heart-warming moment by creating the extraordinary scene among the ordinary space. We would like to propose the artwork, which creates surprises among people, and also delivers epoch-making expression by making a free use of the new techniques and idea. Hand painted work of “Trick Art” is capable to realize the development of artwork without the limitation of the place such as the wall of the high building or the asphalt where the cars go by. There is a high flexibility on the creation of the artwork not only relating to the places but also targeting the actual human beings or animals, imaginary creatures and space. We can express any figure and the form, which people can imagine. The charm of “One-of-a kind item” which the printed work cannot realize enhances the art and its value when used in advertisement or campaign. For this work, we receive many requests from the client. We also work on the digital processing work, which is short-term delivery and low cost in compliance with the various usages. Advertisement effect of 3D art is out-standing when you have campaigns in several places at the same time where you need the copies maintaining the high quality. We create the attractive 3D artwork based on the techniques we developed through “Trick Art”. SD’s Art studio, Atelier where all of the work is born. 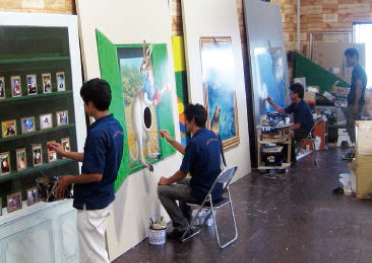 Various artworks such as the wall painting, floor painting, and three-dimensional object are produced at Atelier by production staff with the wishes “we want to deliver the peaceful mind and new impression to many people”. SD Corporation is adapting the “Atelier System” where production staff competes one’s technique against each other. We continue to evolve the “Trick Art” by conducting the collaboration work and an apprentice education at the same time.